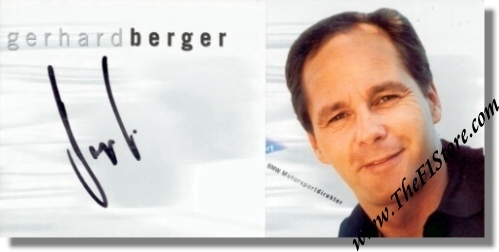 Gerhard Berger signed BMW Motorsport Fan Card. This card is issued by Gerard himself and the inside lists his curriculum from 1984 to 1998 when he became Motorsport Director at BMW. The card is boldly signed on the front flap in black marker. 8.4 x 4.1 inches, folds open to 13.2 x 4.1 inches.